Coca-Cola Beverages Florida to Donate $12,500 to 100 Black Men of Jacksonville, Inc. in Celebration of Black History Month – 100 Black Men of America, Inc.
Tampa, FL—(BUSINESS WIRE)— On March 30, 2018, Coca-Cola Beverages Florida (Coke Florida) will present their donation of $12,500 to 100 Black Men of Jacksonville, Inc. This is the fourth check presentation Coke Florida will host, following their commitment during Black History Month to donate a total of $50,000, evenly distributed, to four local charities. The other organizations are: 100 Black Men of South Florida, Inc.; Pinellas Education Foundation; and LIFT Orlando. 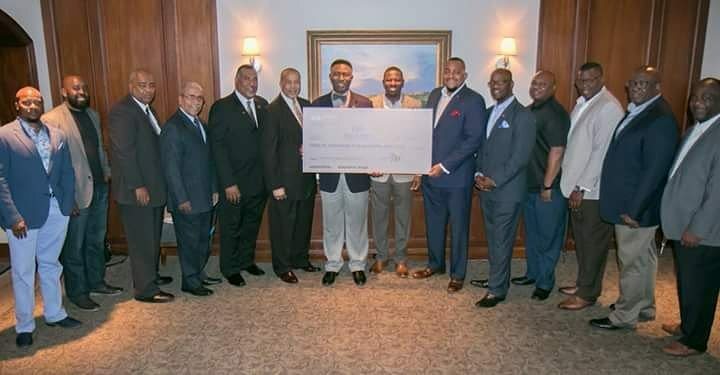 100 Black Men of Jacksonville will use Coke Florida’s donation to support a number of initiatives, including: five $1000 student scholarships; the annual 100 Black Men of Jacksonville College Tour; the 100 Black Men Project Success Leadership Development Program; the 2018 Bernard V. Gregory / 100 Black Men of Jacksonville event; and several other outreach activities. Details about the other three organizations, and the remaining check presentations, will be released to local media in their respective markets. Coca-Cola Beverages Florida, LLC (Coke Florida) is a family-owned, franchise Coca-Cola bottler. Coke Florida’s exclusive territory covers over 18 million consumers across 47 Florida counties, and includes the major metropolitan markets of Jacksonville, Miami, Orlando and Tampa. Coke Florida sells, manufactures, and distributes over 600 products of The Coca-Cola Company and other partner companies. Coke Florida is the third largest privately held Coca-Cola bottler and the sixth largest independent bottler of Coca-Cola products in the United States. Coke Florida was founded in 2015 and is headquartered in Tampa, Florida. For more information, please visit www.cocacolaflorida.com. About 100 Black Men of Jacksonville, Inc. The 100 Black Men of Jacksonville, Inc. remains firmly committed to improving the quality of life for families in Duval County. They are a dedicated group of African American men from various professional backgrounds who are established leaders in various fields including business, government, education, medicine, law, finance, technology, sales, marketing, real estate and public affairs. These men utilize their diverse talents to assist others and empower their community to improve economic well-being. In addition, the 100 continue to help youth in their community through established mentoring and education programs. They assist youth to achieve success academically and through personal development. The 100 Black of Jacksonville, Inc. empower children throughout Duval County to excel and become examples in the community through leadership programs and one-on-one mentoring.